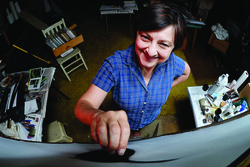 Artist Corinne Jones works in her studio behind her home in Carrizo Creek Estates northeast of Nacogdoches. Jones is one of the contributing artists to this year's 12x12 exhibition and silent auction on display through July 20 at The Cole Art Center @ The Old Opera House in downtown Nacogdoches. Sponsored by the SFA Friends of the Visual Arts, proceeds from the sale of works by more than 70 artists go to fund art scholarships. NACOGDOCHES, TEXAS - It wasn't until she was 22 that Corinne Jones decided she wanted to start taking art classes at the University of Southern Mississippi. "I was living there at the time," Jones said in an email interview. "I learned there was so much I didn't know about art and kept taking classes until I completed my undergraduate Bachelor of Fine Arts degree. I still didn't know very much and went on to complete a Master of Arts and Master of Fine Arts from the School of Art at SFA." And one of the most appealing aspects that keeps fueling her passion for art: "I am still learning about art every time I work in the studio." This local artist, who is a former art educator, will have her work displayed as part of the annual 12x12 fundraiser sponsored by the SFA Friends of the Visual Arts to raise scholarship funds for students enrolled in the Stephen F. Austin State University School of Art. Two weeks of silent bidding on the 12-inch-by-12-inch panels of artwork created by approximately 70 artists from Nacogdoches, Lufkin and other areas of East Texas will conclude with the annual party and sale at 6 p.m. Saturday, July 20, in The Cole Art Center @ The Old Opera House in downtown Nacogdoches. Born in Wilmington, Del., and raised in Camp Hill, Pa., Jones, who is married to Charles D. Jones, professor emeritus in the SFA School of Art who is now the director and master printer for the LaNana Creek Press in the SFA College of Fine Arts, has lived in Nacogdoches for 35 years. With degrees with an emphasis in painting, Jones has sold art supplies, worked as a framer, worked as a secretary and taught drawing, 2-dimensional and 3-dimensional design and art appreciation, including 13 years at Angelina College and seven years at SFA. She retired from SFA in December 2012. Her artwork is represented by Chandler Fine Art Gallery, San Francisco, Calif., and Avis Frank Gallery, Houston. She continues to work as a professional artist whose work has changed over time. "I now create drawings using multiple layers of charcoal or various natural soils with an under-drawing of colored pastels," she said. "I use these materials to embody natural life cycles. My typical subject matter is of birds or plants. As I garden, I pay attention to sounds." Jones is inspired by "colors, shapes, textures in the world around me and also by ideas about cycles of life and our connection to nature, as well as, books, music and other artists," she said. For the annual 12x12 fundraiser, Jones usually creates "something experimental with materials and non-objective subject matter. This time I created a charcoal drawing with recognizable subject matter." Many years ago, before the Cole Art Center existed, Jones was a board member with the SFA Friends of Art, and she participated in the early planning stages of the downtown art center. The organization, now known as the Friends of the Visual Arts, supports the Cole Art Center and the Griffith Gallery on the SFA campus, as well as the endeavors of the art students and faculty pursuits, Jones said. "There are many important opportunities to engage people in Nacogdoches - the church, Scouting, health issues and so on, all of which contribute to the overall well-being of our community," she said. "I believe the arts are an important contribution to a healthy community and bring grace and awareness to our lives which goes beyond everyday activities." The annual 12x12 fundraiser, party and sale sponsored by the SFA Friends of the Visual Arts and benefiting students enrolled in the Stephen F. Austin State University School of Art gets under way at 6 p.m. Saturday, July 20, in The Cole Art Center @ The Old Opera House in downtown Nacogdoches. The 12-inch-by-12-inch panels of artwork created by East Texas artists have been on display for about two weeks, with local art enthusiasts engaged having the opportunity to offer silent bids to take the coveted donated pieces home. Among the works in the auction is a charcoal drawing by local artist Corinne Jones, who has donated her artwork for many years to the fundraiser. "Participating with the Friends of the Visual Arts is a means for me to give back to SFA and give to the community of Nacogdoches," Jones said. The opening bid during the silent auction is $250 through 5 p.m. on July 20. At the party and sale, each 12x12 artwork not bid on will be sold for $100. The sale is first-come, first-serve basis beginning at 6 p.m. Raffle tickets are sold for $5 each or $20 for five tickets, and any unsold work will be raffled off beginning at 7:05 p.m.
For more information, call The Cole Art Center at (936) 468-6557.